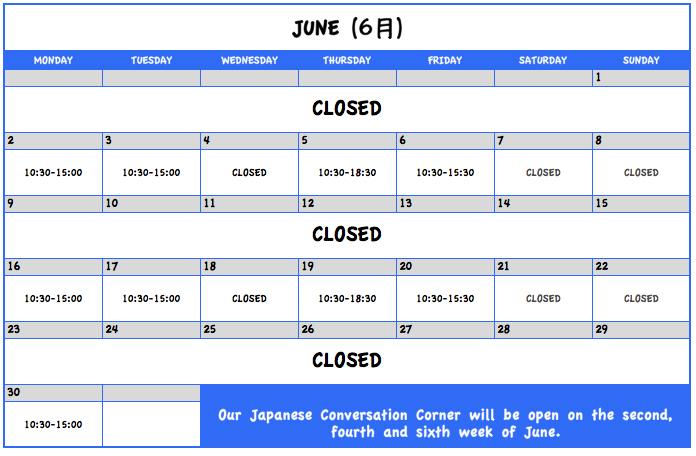 Starting from May 19th (Monday), we will be opening our doors every two weeks to those who want to casually practice their Japanese. You can come in whenever you want (within the fixed hours in the schedule below). Just make sure you send us an e-mail before you drop by or let us know through our twitter (@cosmosjapanese) or facebook (Cosmos Japanese Language School). We have our lunch break from 12:30-13:00 so if you plan to come around that time, feel free to bring your own lunch and join us. Contact us at cosmos.jls@gmail.com if you are interested or would like more information! We are looking forward to hearing from you!